Gustafsson, Y.; Haag, J.; Jungebluth, P.; etc.Viability and proliferation of rat MSCs on adhesion protein-modified PET and PU scaffolds. Biomaterials 2012, 33 (32), 8094-103. Vaquette, C.; Fan, W.; Xiao, Y.; etc. A biphasic scaffold design combined with cell sheet technology for simultaneous regeneration of alveolar bone/periodontal ligament complex. Biomaterials 2012, 33 (22), 5560-5573. Hinderer, S.; Schesny, M.; Bayrak, A.; etc.Engineering of fibrillar decorin matrices for a tissue-engineered trachea. 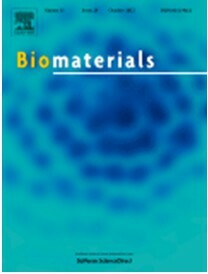 Biomaterials 2012, 33 (21), 5259-5266. Liu, D.; Liu, S.; Jing, X.; Li, X.; Li, W.; Huang, Y., Necrosis of cervical carcinoma by dichloroacetate released from electrospun polylactide mats. Biomaterials 2012, 33 (17), 4362-4369. Wu, N.; Jing, B.; Cao, Q.; Wang, X.; Kuang, H.; Wang, Q., A novel electrospun TPU/PVdF porous fibrous polymer electrolyte for lithium ion batteries. J. Appl. Polym. Sci. 2012, 125 (4), 2556-2563. Sun, Z. C.; Deitzel, J. M.; Knopf, J.; Chen, X.; Gillespie, J. W., The effect of solvent dielectric properties on the collection of oriented electrospun fibers. J. Appl. Polym. Sci. 2012, 125 (4), 2585-2594. Wu, H. J.; Fan, J. T.; Wan, X. F.; Du, N., One-step fabrication of branched poly(vinyl alcohol) nanofibers by magnetic coaxial electrospinning. J. Appl. Polym. Sci. 2012, 125 (2), 1425-1429. Zhao, F. W.; Liu, Y.; Yuan, H. L.; Yang, W. M., Orthogonal design study on factors affecting the degradation of polylactic acid fibers of melt electrospinning. J. Appl. Polym. Sci. 2012, 125 (4), 2652-2658. He, S. H.; Li, X. H.; Yang, Y.; Jia, G. Q.; Zou, J., Correlations of in vitro and in vivo degradation tests on electrospun poly-DL-lactide-poly(ethylene glycol) fibers. J. Appl. Polym. Sci. 2012, 125 (3), 2207-2215. Chakrapani, V. Y.; Gnanamani, A.; Giridev, V. R.; Madhusoothanan, M.; Sekaran, G., Electrospinning of type I collagen and PCL nanofibers using acetic acid. J. Appl. Polym. Sci. 2012, 125 (4), 3221-3227. Li, Q.; Satur, D. J. G.; Kim, H.; Kim, H. G., Preparation of sol-gel modified electrospun TiO2 nanofibers for improved photocatalytic decomposition of ethylene. Mater. Lett. 2012, 76, 169-172. Li, C.; Zhang, X.; Dong, W.; Liu, Y., High photocatalytic activity material based on high-porosity ZnO/CeO2 nanofibers. Mater. Lett. 2012, 80, 145-147. 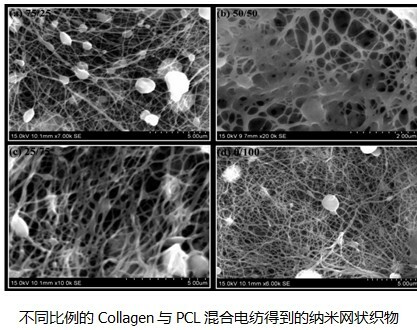 Li, N.; Hui, Q.; Xue, H.; Xiong, J., Electrospun Polyacrylonitrile nanofiber yarn prepared by funnel-shape collector. Mater. Lett. 2012, 79, 245-247. Ma, C.; Song, Y.; Shi, J.; Zhang, D.; Zhong, M.; Guo, Q.; Liu, L., Phenolic-based carbon nanofiber webs prepared by electrospinning for supercapacitors. Mater. Lett. 2012, 76, 211-214. Castillo-Ortega, M. M.; Montano-Figueroa, A. G.; Rodriguez-Felix, D. E.;etc. Amoxicillin embedded in cellulose acetate-poly (vinyl pyrrolidone) fibers prepared by coaxial electrospinning: Preparation and characterization. Mater. Lett. 2012, 76, 250-254.